A banker named Andrew Huszar that helped manage the Federal Reserve’s quantitative easing program during 2009 and 2010 is publicly apologizing for what he has done. He says that quantitative easing has accomplished next to nothing for the average person on the street. Instead, he says that it has been “the greatest backdoor Wall Street bailout of all time.” And of course the cold, hard economic numbers support what Huszar is saying. The percentage of working age Americans with a job has not improved at all during the quantitative easing era, and median household income has actually steadily declined during that time frame. Meanwhile, U.S. stock prices have doubled overall, and the stock prices of the big Wall Street banks have tripled. 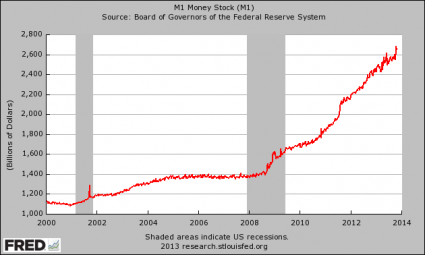 So who benefits from quantitative easing? It doesn’t take a genius to figure it out, and now Andrew Huszar is blowing the whistle on the whole thing. That was when I realized the Fed had lost any remaining ability to think independently from Wall Street. Having racked up hundreds of billions of dollars in opaque Fed subsidies, U.S. banks have seen their collective stock price triple since March 2009. The biggest ones have only become more of a cartel: 0.2% of them now control more than 70% of the U.S. bank assets. The American people are still being told that quantitative easing is “economic stimulus” which will make the lives of average Americans better. That is a flat out lie and the folks over at the Federal Reserve know this. And this is exactly what has happened in the United States as well. U.S. stocks have risen 108% while Barack Obama has been in the White House. Meanwhile, things have continued to get even tougher for ordinary Americans. While Obama has been in the White House, the percentage of working age Americans with a job has declined from 60.6% to 58.3%, median household income has declined for five years in a row, and poverty has been absolutely exploding. But the fact that it has been very good for Wall Street while doing essentially nothing for ordinary Americans is not the biggest problem with quantitative easing. The biggest problem with quantitative easing is that it is destroying worldwide faith in the U.S. dollar and in the U.S. financial system. The rest of the world is watching the Fed go crazy, and they are beginning to openly wonder why they should continue to use the U.S. dollar as the de facto reserve currency of the planet. Right now, most global trade involves the use of U.S. dollars. In fact, far more U.S. dollars are actually used outside of the United States than are used inside the country. This creates a tremendous demand for U.S. dollars around the planet, and it keeps the value of the U.S. dollar at a level that is far higher than it otherwise would be. If the rest of the world decides to start moving away from the U.S. dollar (and this is already starting to happen), then the demand for the U.S. dollar will fall and we will not be able to import oil from the Middle East and cheap plastic trinkets from China so inexpensively anymore. In addition, major exporting nations such as China and Saudi Arabia end up with giant piles of U.S. dollars due to their trading activities. Instead of just sitting on all of that cash, they tend to reinvest much of it back into U.S. Treasury securities. This increases demand for U.S. debt and drives down interest rates. If the Federal Reserve continues to wildly create money out of thin air with no end in sight, the rest of the world may decide to stop lending us trillions of dollars at ultra-low interest rates. When we get to that point, it is going to be absolutely disastrous for the U.S. economy and the U.S. financial system. If you doubt this, just read this article. The only way that the game can continue is for the rest of the world to continue to be irrational and to continue to ignore the reckless behavior of the Federal Reserve. We desperately need the rest of the planet “to ignore the man behind the curtain”. We desperately need them to keep using our dollars that are rapidly being devalued and to keep loaning us money at rates that are far below the real rate of inflation. If the rest of the globe starts behaving rationally at some point, and they eventually will, then the game will be over. Let us hope and pray that we still have a bit more time until that happens.